Many of our customers know how to find their nearest cell phone tower and have the best information on cell phone signal boosters. But coaxial cables? We get plenty of questions about that on a regular basis, so the time has come to answer them. When signal travels through a cable, it loses strength. The shorter the cable, the less signal loss occurs. When thinking about signal strength, it is imperative to get the right length of cable to maintain quality signal. All cell phone signal boosters are sold as complete kits per FCC regulations. 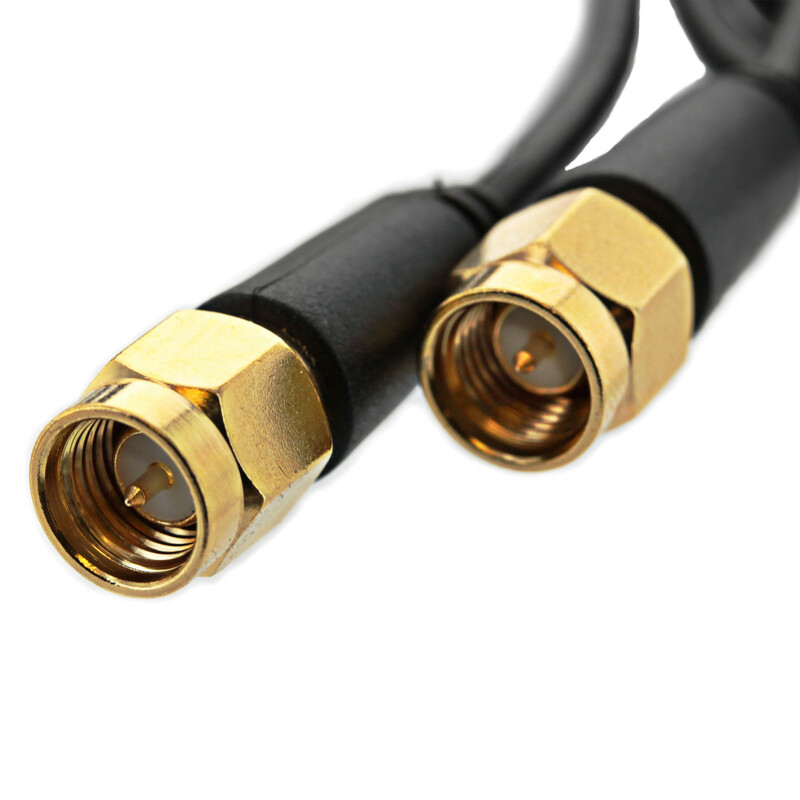 The coaxial cables kitted with the booster will generally work for most setups, however, they may not be optimized for your specific situation. There may be times when the cable provided is longer than it needs to be, and your booster’s output is reduced. Or you may have the opposite situation, where you need a bit more reach. In these situations, it is important to figure out how much length you can afford before signal loss offsets any signal gain. First, it's important to identify your cable type and connector. 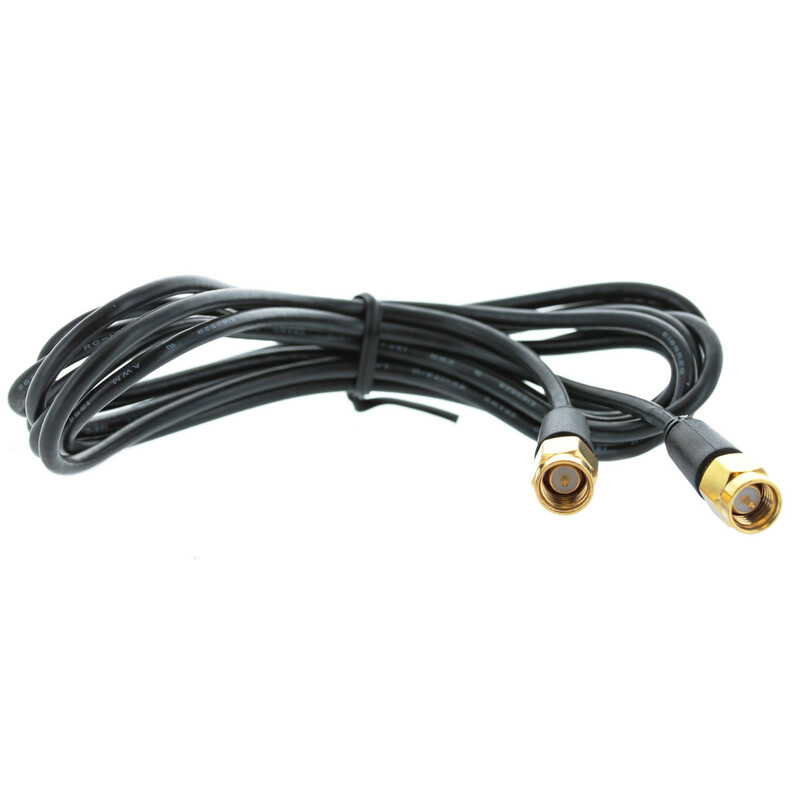 The RG6 cable is a 75 ohm cable with F-Type connectors. This is the same cable used with many Cable/Satellite TV devices and comes pre-wired in many homes, making it simple to wire and install. The F-Type connector is a mid-size connector designed for common use. It is the most widely used coaxial connector for residential wiring. Mainly used for the average home installation that covers 2,500 to 5,000 sq ft. Cable length from 20 to 50 feet. Comes only in white. These come kitted with the popular weBoost Connect 4G and the budget weBoost Home 4G. The RG11 cable is another 75 ohm cable with F-Type connectors. What separates it from the R6 is its range: whereas the R6 tops out at 50 feet, the RG11 ranges from 50 to 100 feet and features lower loss. These do not come pre-kitted with any of our signal boosters, but are highly recommended if you believe it is likely you will be running over 50 feet of cable to power your booster. The Wilson400 cable is an LMR400 spec cable. 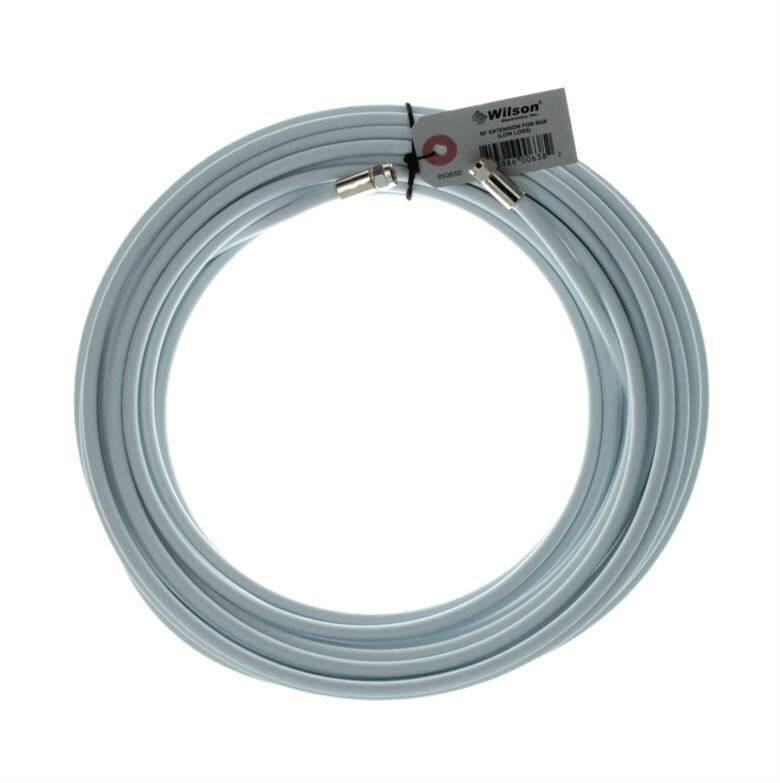 These are 50 ohm, pro-grade coaxial cables designed for large installations from 7,500 to 50,000 square feet. Cable length ranges from 50 to 1000 feet, spooled. 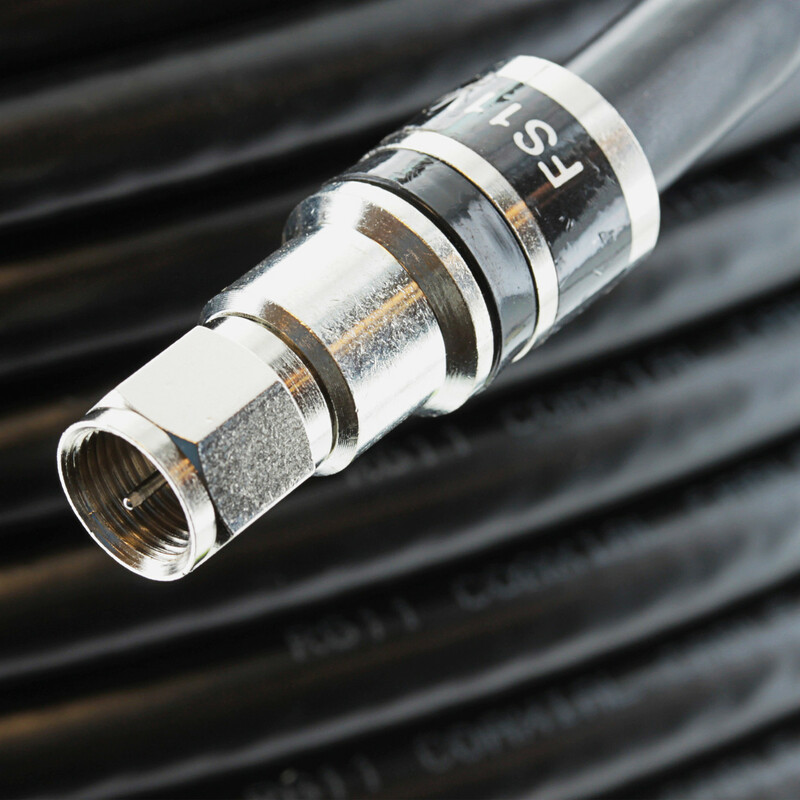 Your installer will typically apportion the cable into shorter lengths to cover the range of the installation while maintaining quality signal strength. This Wilson400 is fitted with an N-Type connector, a large connector designed to be used with thick, commercial cable. The most popular units that include these cables are the weBoost Connect 4G-X and the WilsonPro line of commercial signal boosters. However, they are compatible with any equipment that uses 50 Ohm cables fitted with N-Connectors. 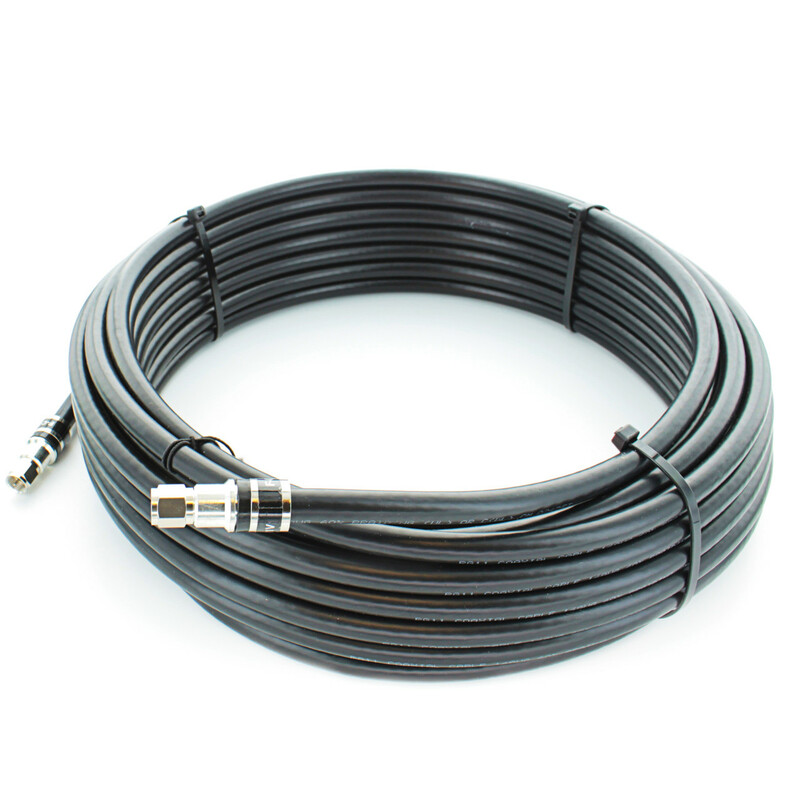 If you need to run cable in excess of 150 feet, your installer may recommend either an LMR600 or a “half inch” coaxial cable. These are extremely thick cables which are much more industrial than any of the above mentioned varieties, and are expensive to boot. An installer will only recommend either of these in rare, specialized situations depending on individual need, but should they do so they will certainly have good cause. These are the best available cables to maintain a quality signal strength on the market. The difference between an LDF4 and an AI4 RPV-50 is the interior - the LDF4 has a foam covering, and the AI4 RPV-50 has nothing. The difference in function, however, is minimal. RG58 and RG174 cables are used in cell phone signal boosters for vehicles. The difference between the two is the better low-loss quality of the RG58 with cable length up to 20 feet compared to the RG174’s 6 feet. For large vehicles, such as RVs or boats, the RG174 is preferred. Both are fitted with SMA connectors. These are small, copper connectors used in modems and the like. They are relatively inexpensive, which allow for the cable’s cheaper cost. The difference between the two is the better low-loss quality of the RG58 with cable length up to 20 ft compared to the RG174's max length of 6 ft. Compatible with weBoost Drive 4G-M, weBoost Drive Sleek, and the weBoost Drive 4G-S.
As mentioned before, with increasing cable length more signal loss occurs. Signal gain and loss is measured in decibels (dB). And decibels are measured exponentially. A loss of 3 dB means a weakened signal by 2x! Per the chart, the Wilson400 (and the equally powerful RG11) has the best minimal loss and is almost twice as effective compared to the RG6 for home installations. The only cables more mighty are the pricey LG600 and even pricier Half-Inch. The RG174 should never be installed in any unit that needs more than 6 feet of cable since it does a poor job of carrying signal at 10 feet. As always, you can convert your cable installation with special cable connectors and adapters. However, to mix and match 50 ohm & 75 ohm cables and systems would lead to further signal loss, so it's best to stay consistent with the same type of relevant 50 or 75 ohm system and cables. For you do-it-yourselfers out there, what exactly is the difference between 50 and 75 ohm cables? Think of signal as a drink and cables as straws. 75 ohm cables are your typical soda straws and 50 ohm cables are those big gulp carnival straws.